Tina Meranda of Meranda-Nixon Winery in Ripley shares her favorite recipe featuring the winery’s luscious reserve Chardonnay, a complex, full-bodied dry white wine with buttery oak and honey flavors that compliment this rich seafood dip. Place the shrimp in a shallow baking dish. Add the wine and stir to coat. Cover and set aside at room temperature for one hour. Strain the shrimp from the wine marinade, reserving the liquid. Add the shrimp back to the bowl and stir in the remaining ingredients. Taste and add just enough of the wine, if necessary, to make the mixture spreadable. 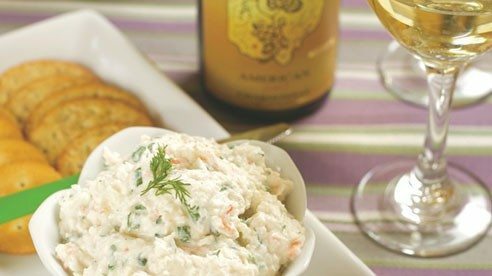 Chill for an hour or serve at room temperature with an assortment of crackers.